"jal.com" redirects here. For other uses, see Jal (disambiguation). Not to be confused with Air Japan, the charter carrier. Japan Airlines Co., Ltd. (JAL) (日本航空株式会社, Nihon Kōkū Kabushiki-gaisha, TYO: 9201, OTC Pink: JAPSY), also known as Nikkō (日航), is the flag carrier airline of Japan. It is headquartered in Shinagawa, Tokyo, Japan, and its main hubs are Tokyo's Narita International Airport and Tokyo International Airport (Haneda Airport), as well as Osaka's Kansai International Airport and Osaka International Airport. JAL group companies include Japan Airlines, J-Air, JAL Express, Japan Air Commuter, Japan Transocean Air, and Ryukyu Air Commuter for domestic feeder services, and JAL Cargo for cargo and mail services. JAL group operations include scheduled and unscheduled international and domestic passenger and cargo services to 220 destinations in 35 countries worldwide, including codeshares. The group has a fleet of 279 aircraft. In the fiscal year ended 31 March 2009, the airline group carried over 52 million passengers and over 1.1 million tons of cargo and mail. Japan Airlines, J-Air, JAL Express, and Japan Transocean Air are members of the Oneworld airline alliance network. JAL was established in 1951 and became the national airline of Japan in 1953. After over three decades of service and expansion, the airline was fully privatised in 1987. In 2002, the airline merged with Japan Air System, Japan's third-largest airline and became the sixth-largest airline in the world by passengers carried. Japan Airlines is currently an official sponsor of Japan Football Association, Japan national football team, Shimizu S-Pulse, and Consadole Sapporo. All Nippon Airways, the largest airline in Japan, is JAL's main competitor. Japan Air Lines Co., Ltd. was established on 1 August 1951, with the government of Japan recognising the need for a reliable air transportation system to help Japan grow in the aftermath of the World War II. The airline was founded with an initial capital of ¥100 million; its headquarters are located in Ginza, Chūō, Tokyo. Between 27 and 29 August, the airline operated invitational flights on a Douglas DC-3 Kinsei, leased from Philippine Airlines. On 25 October, Japan's first postwar domestic airline service was inaugurated, using a Martin 2-0-2 aircraft, named Mokusei, and crew leased from Northwest Airlines. On 1 August 1953, the National Diet passed the Japan Air Lines Company Act, forming a new state-owned Japan Air Lines on 1 October, which assumed all assets and liabilities of its private predecessor. By 1953, the JAL network extended northward from Tokyo to Sapporo and Misawa, and westward to Nagoya, Osaka, Iwakuni, and Fukuoka. On 2 February 1954, the airline began international flights, carrying 18 passengers from Tokyo to San Francisco on a Douglas DC-6B City of Tokyo via Wake Island and Honolulu. The flights between Tokyo and San Francisco are still Flights 1 and 2, to commemorate its first international service. The early flights were advertised as being operated by American crews and serviced by United Air Lines in San Francisco. The airline, in addition to the Douglas DC-3, Douglas DC-6B, and Martin 2-0-2s, operated Douglas DC-4s and Douglas DC-7Cs during the 1950s. JAL flew to Hong Kong via Okinawa by 1955, having pared down its domestic network to Tokyo, Osaka, Fukuoka, and Sapporo. By 1958, the Hong Kong route had been extended to Bangkok and Singapore. 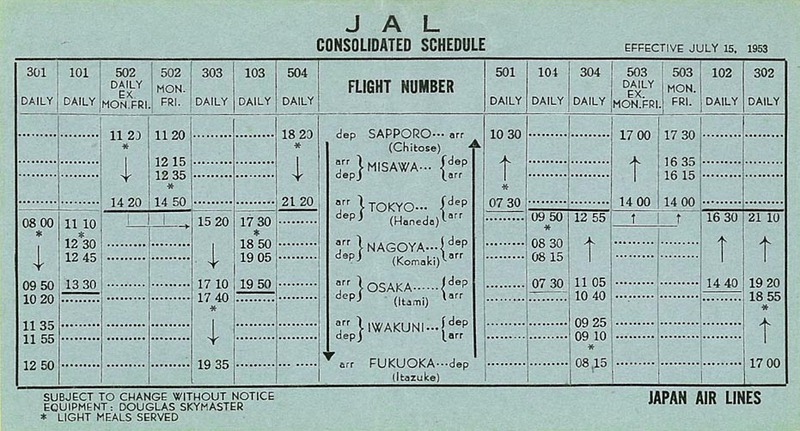 With DC-7Cs, JAL was able to fly nonstop between Seattle and Tokyo in 1959. In 1960, the airline took delivery of its first jet, a Douglas DC-8 named Fuji, introducing jet service on the Tokyo-Honolulu-San Francisco route. JAL went on to operate a fleet of 51 DC-8s, retiring the last of the type in 1987. Fuji flew until 1974 and was then used as a maintenance training platform until 1989; its nose section was stored at Haneda Airport and eventually put on public display at the JAL Sky Museum in March 2014. 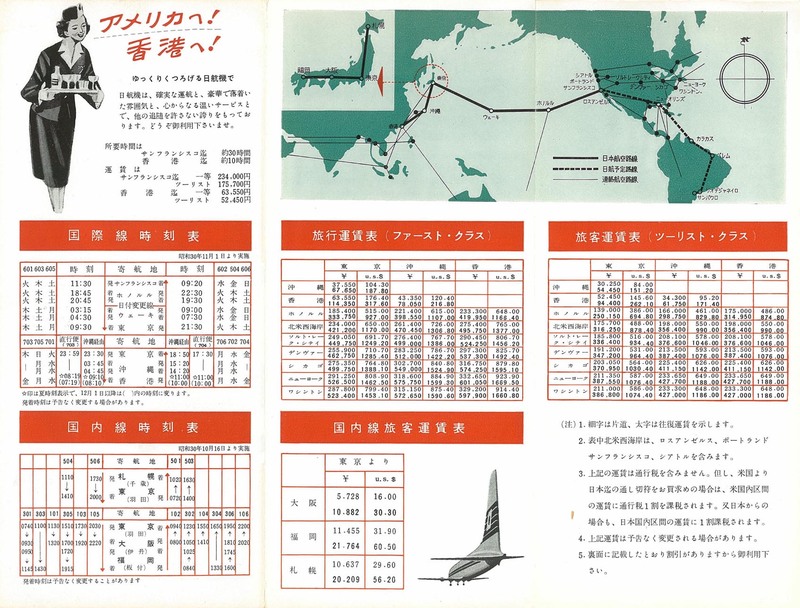 JAL also began flying to Seattle and Hong Kong in 1960. 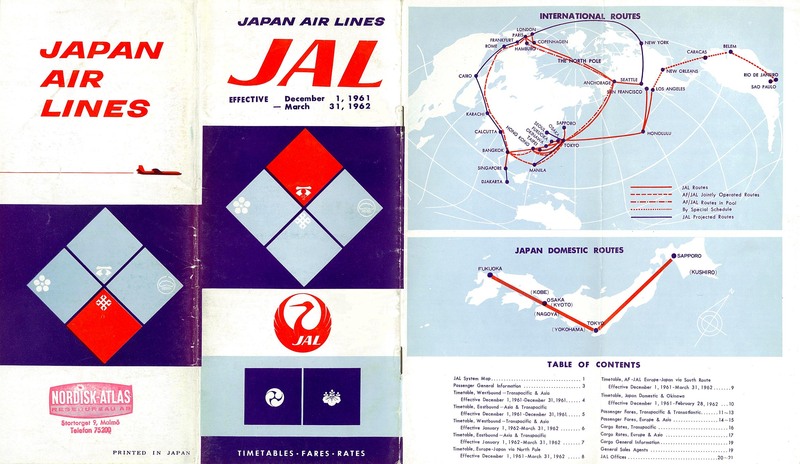 At the end of 1961, JAL had transpolar flights from Tokyo to Seattle, Copenhagen, London, and Paris via Anchorage, Alaska, and to Los Angeles and San Francisco via Honolulu, Hawaii. During the 1960s, JAL flew to many new cities, including Moscow, New York, and Pusan. DC-8 flights to Europe via Anchorage started in 1961; flights to Europe via India started in 1962, initially with Convair 880s. By 1965, Japan Air Lines was headquartered in the Tokyo Building in Marunouchi, Chiyoda, Tokyo. By this time, over half of JAL's revenue was generated on transpacific routes to the United States, and the airline was lobbying the United States for fifth freedom rights to fly transatlantic routes from the East Coast. The transpacific route was extended east from San Francisco to New York in November 1966 and to London in 1967; flights between San Francisco and London ended in December 1972. Between 1967 and 1969, JAL had an agreement with Aeroflot to operate a joint service between Tokyo and Moscow using a Soviet Tupolev Tu-114. The flight crew included one JAL member, and the cabin crew had five members each from Aeroflot and JAL. The weekly flight started in April 1967; in May, the schedule was 10 hr 35 min Moscow to Tokyo and 11 hr 25 min to return. In 1972, under the 45/47 system (45/47体制, yongo-yonnana taisei), the so-called "aviation constitution" enacted by the Japanese government, JAL was granted flag carrier status to operate international routes. The airline was also designated to operate domestic trunk routes in competition with All Nippon Airways and Toa Domestic Airlines. The signing of a civil air transport agreement between China and Japan on 20 April 1974 caused the suspension of air routes between the Taiwan and Japan on 21 April. A new subsidiary, Japan Asia Airways, was established on 8 August 1975, and air services between the two countries were restored on 15 September. During the 1970s, the airline bought the Boeing 727, Boeing 747, and McDonnell Douglas DC-10 for its growing routes within Japan and to other countries. In the 1980s the airline performed special flights for the Crown Prince Akihito and Crown Princess Michiko of Japan, Pope John Paul II and for Japanese prime ministers, until the introduction of the dedicated government aircraft using two Boeing 747-400, operated as Japanese Air Force One and Japanese Air Force Two. During that decade, the airline introduced new Boeing 747-100SR, Boeing 747-SUD, and Boeing 767 jets to the fleet, and retired the Boeing 727s and Douglas DC-8s. In 1978, JAL started flights to São Paulo and Rio de Janeiro via Anchorage and San Juan; the stopover was changed to Los Angeles in 1982 and to New York's John F. Kennedy International Airport in 1999. Until 2009, the airline operated fifth-freedom flights between New York and São Paulo and between Vancouver and Mexico City. Japan began considering airline deregulation in the late 1970s, with the government announcing the abandoning of the 45/47 system in 1985. In 1987, Japan Airlines was completely privatised, and the other two airlines in Japan, All Nippon Airways and Japan Air System, were permitted to compete with JAL on domestic and international routes. Increased competition resulted in changes to the airline's corporate structure, and it was reorganised into three divisions: international passenger service, domestic passenger service, and cargo (including mail) service. Japan Airlines began the 1990s with flights to evacuate Japanese citizens from Iraq before the start of the Gulf War. In October 1990, Japan Air Charter was established, and in September 1996, an agreement with the Walt Disney Company made Japan Airlines the official airline of Tokyo Disneyland. JAL Express was established in April 1997, with Boeing 737 aircraft. In the 1990s, the airline encountered further economic difficulties stemming from recessions in the United States and United Kingdom, plus a domestic downturn. Following years of profit since 1986, the airline began to post operating losses in 1992. Cost-cutting, including the formation of the low-cost JAL Express domestic subsidiary and the transfer of tourist operations to JALways (the successor to Japan Air Charter), helped return the airline to profitability in 1999. In 1997, the airline flew Japanese Prime Minister Ryutaro Hashimoto to Peru to help negotiate in the Japanese embassy hostage crisis. Japan Airlines placed orders for Boeing 777s during the 1990s, allowing for fleet renewal. It was one of eight airlines participating in the Boeing 777 design process, shaping the design to their specifications. In 2001, Japan Air System and Japan Airlines agreed to merge; and on 2 October 2002, they established a new holding company called Japan Airlines System (日本航空システム, Nihon Kōkū Shisutemu), forming a new core of the JAL Group. Aircraft liveries were changed to match the design of the new JAL Group. At that time, the merged group of airlines was the sixth-largest in the world by passengers carried. On 1 April 2004, JAL changed its name to Japan Airlines International and JAS changed its name to Japan Airlines Domestic. JAS flight codes were changed to JAL flight codes, JAS check-in desks were refitted in JAL livery, and JAS aircraft were gradually repainted. On 26 June 2004, the parent company Japan Airlines System was renamed to Japan Airlines Corporation. 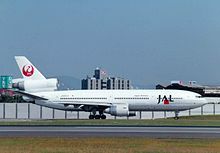 Following the merger, two companies operated under the JAL brand: Japan Airlines International (日本航空インターナショナル, Nihon Kōkū Intānashonaru) and Japan Airlines Domestic (日本航空ジャパン, Nihon Kōkū Japan). Japan Airlines Domestic had primary responsibility for JAL's large network of intra-Japan flights, while JAL International operated both international and trunk domestic flights. On 1 October 2006, Japan Airlines International and Japan Airlines Domestic merged into a single brand, Japan Airlines International. The airline applied to join Oneworld on 25 October 2005. Japan Airlines claimed that its Oneworld membership would be in the best interests of the airline's plans to further develop the airline group and its strong commitment to provide the very best to its customers. Japan Airlines, together with Malév and Royal Jordanian, joined the alliance on 1 April 2007. On 1 April 2008, JAL merged the operations of its subsidiary Japan Asia Airways (JAA) into JAL mainline operations. JAA had operated all JAL group flights between Japan and Taiwan between 1975 and 2008 as a separate entity due to the special political status of Taiwan. In 2009, Japan Airlines suffered steep financial losses, despite remaining Asia's largest airline by revenue. As a result, the airline embarked on staff cuts and route cutbacks in an effort to reduce costs. The carrier also received ¥100 billion through capital injection and credit from the Japanese government as part of the proposed bankruptcy. In September 2009, Japan's Ministry of Land, Infrastructure, Transport and Tourism formed a task force aimed at aiding a corporate turnaround at JAL, which examined various cost-cutting and strategic partnership proposals. One proposal considered was to merge JAL with All Nippon Airways (ANA), which would create a single larger international airline and replace Japan Airlines International; however, media reports suggested that this proposal would be opposed by ANA given its comparatively better financial performance as an independent carrier. The task force also examined possible partnerships with foreign carriers. After weeks of speculation, JAL applied for protection under the Corporate Rehabilitation Law (the Japanese equivalent of Administration in the United Kingdom or a Chapter 11 bankruptcy filing in the United States) on 19 January 2010. JAL would receive a ¥300 billion cash injection and have debts worth ¥730 billion waived, in exchange for which it will cut its capital to zero, cut unprofitable routes and reduce its workforce by 15,700 employees—a third of its 47,000 total. JAL's main creditors (Mizuho Corporate Bank, Bank of Tokyo-Mitsubishi UFJ and Sumitomo Mitsui Banking Corporation) originally objected to the bankruptcy declaration, but changed their positions after the Enterprise Turnaround Initiative Corporation of Japan recommended court protection, according to a senior bank official. Shares of JAL were delisted from the Tokyo Stock Exchange on 20 February 2010. At a time, its stock was considered one of "bluest of blue chips" of Japan. At the time, the bankruptcy was the largest Japanese bankruptcy involving a non-financial company and the fourth largest in Japan's history. Kazuo Inamori, founder of Kyocera and KDDI, took over as CEO of JAL. Transport minister Seiji Maehara personally visited Kyocera headquarters in late 2009 to persuade Inamori to accept the position; task force leader Shinjiro Takagi believed that appointing a proven entrepreneur CEO was necessary to fix the various problems at JAL. Japan Air Commuter president Masaru Onishi was promoted to president of JAL. In May, JAL began to see an increase in its passenger numbers by 1.1% year-on-year. In August, it was reported that JAL would cut 19,133 jobs from its workforce of 47,000 by the end of March 2015 – whilst also increasing capacity – in an attempt to make the business viable. Although JAL ultimately exited bankruptcy while remaining in the Oneworld alliance, JAL was seriously considering accepting a strategic investment from Delta Air Lines and joining the SkyTeam alliance during the period between September 2009 and February 2010. JAL also had talks with Skyteam members Air France-KLM and Korean Air regarding their potential involvement. The Delta deal was favored by the Ministry of Land, Infrastructure, Transport and Tourism because Delta had an extensive global network and had the largest Japanese operation of any foreign airline, which it had inherited through its merger with Northwest Airlines. MLITT also supported a transaction with Air France-KLM because it was a "healthier company" than American. American planned to team up with Oneworld alliance members British Airways and Qantas to make a joint offer to recapitalise JAL. British Airways said that it was attempting to persuade JAL to remain part of Oneworld rather than aligning itself with Delta and SkyTeam, while American CEO Gerard Arpey said that American and Oneworld remained committed to a partnership with Japan Airlines, as long as it remained a major international carrier, and reiterated his encouragement for JAL to stay with Oneworld during ceremonies to welcome Mexicana into the alliance. In an interview with the Asahi Shimbun on 1 January 2010, JAL president Haruka Nishimatsu stated his preference in forming a partnership with Delta over American, and the Yomiuri Shimbun reported shortly thereafter that JAL and the Japanese government-backed Enterprise Turnaround Initiative Corporation would likely choose to form a business and capital tie-up with Delta, as part of which JAL would enter SkyTeam and reduce its international flight operations in favor of code-share agreements with Delta, and that American Airlines had begun procedures to end negotiations with JAL. Both JAL and American denied the report. The Wall Street Journal then reported that American Airlines raised its JAL investment offer by $300 million, to $1.4 billion, and in separate comments to the press, Delta president Ed Bastian said that Delta was "willing and able to raise additional capital through third-party resources." JAL was one of the largest Boeing 747 operators (the other being British Airways and Singapore Airlines). The last 747 was retired in early 2011 as part of its restructuring program, ending 41 years of 747 service. After JAL filed for bankruptcy, there were further media reports that JAL would leave Oneworld in favor of SkyTeam, but JAL president Masaru Onishi said on 1 February that the new JAL leadership was "seriously reviewing the issue from scratch, without being influenced by previous discussions," and its decision on an alliance partner would be made soon. On 7 February, several news outlets reported that JAL would decide to keep its alliance with American Airlines and end talks with Delta. Inamori and ETIC officials, according to the reports, decided that switching alliances from Oneworld to Skyteam would be too risky and could hinder JAL's ability to turn around quickly. Two days later, JAL officially announced that it would strengthen its partnership with American, including a joint application for antitrust immunity on transpacific routes. The airline would also fortify its relationship with other partners in the Oneworld alliance. JAL emerged from bankruptcy protection in March 2011. In July, ETIC selected Nomura Holdings, Daiwa Securities, Mitsubishi UFJ, Morgan Stanley, Mizuho Securities, SMBC, and Nikko Securities to underwrite the sale of its equity stake in JAL, without specifying amounts or dates. On 6 January 2012, JAL announced its intent to relist its shares on the Tokyo Stock Exchange in an initial public offering (IPO) of up to ¥1 trillion, which would be the largest offering in Japan in more than a year. The airline completed its IPO on the 1st section of the Tokyo Stock Exchange (TYO: 9201) on 19 September 2012. The Enterprise Turnaround Initiative Corporation of Japan sold all its holdings (96.5%) in JAL for ¥650 billion, greater than its ¥350 billion investment in 2010. Though it was oversubscribed several times, the post-IPO increase of the stock was close to 1%. Following its exit from bankruptcy protection, JAL began several new partnerships within the Oneworld alliance. The transpacific joint venture between JAL and American commenced in April 2011. JAL formed Jetstar Japan, a low-cost carrier joint venture with Qantas subsidiary Jetstar Airways, in July. In 2012, JAL and British Airways parent company International Airlines Group (IAG) submitted applications to the Japanese government and European Union respectively in seeking a joint venture business operation for flights between Japan and Europe. Finnair applied to join the JV with IAG in July 2013, in conjunction with JAL starting new nonstop service to Helsinki. Subsidiaries and Affiliates of Japan Airlines. Japan Air Commuter (JAC) – turboprop services in western Japan, mainly including Amami Islands. JALways was the airline's international subsidiary, which handled low-yield flights to resort destinations in Hawaii, Oceania, and Southeast Asia. JAL Express (JEX) was the airline's low-cost carrier for jet services between secondary cities, it merged into Japan Airlines in 2014. JALUX Inc., established in 1962, is the airline's procurement business which handles various work for the company, including the JAL SELECTION merchandise and in-flight meals and refreshments, supplies for Blue Sky and JAL-DFS shops, aircraft fuel components, cabin services, and in-flight duty-free. JALUX merged with JAS Trading on 1 January 2004, to unify support operations for the JAL group. JAL Cargo is the brand of the airline group's freight service and is a member of the WOW cargo alliance with these products: J Speed, General Cargo, and Dangerous Goods. In the fiscal year ended 31 March 2009, the cargo division carried 500,779 tonnes of freight domestically and 627,213 tonnes of freight internationally. On 1 April 2011, the airline changed its trade name from Japan Airlines International Co., Ltd (株式会社日本航空インターナショナル, Kabushiki-gaisha Nihon Kōkū Intānashonaru) to Japan Airlines Co., Ltd (日本航空株式会社, Nihon Kōkū Kabushiki-gaisha). in the first quarter of 2019, JAL launches its low cost carrier, ZIPAIR Tokyo, which will focus on medium to long-haul destinations. It is estimated to commence operation in summer 2020. The headquarters, the Nomura Fudosan Tennozu Building (野村不動産天王洲ビル, Nomura Fudōsan Tennōzu Biru), are located on Tennōzu Isle in Higashi Shinagawa, Shinagawa, Tokyo. The 26-floor building was a project of the Kajima Corporation. The building, which also has two underground levels, has a land area of 11,670.4 square metres (125,619 sq ft) and a floor area of 82,602.11 square metres (889,121.7 sq ft). Several divisions of JAL, including JALPAK, JAL Aero-Consulting, and JAL Hotels are located in the building. The building also houses the Japan office of American Airlines. It is also known as the JAL Building (ＪＡＬビルディング, JAL Birudingu), the Japan Airlines Headquarters, and the Shinagawa Kyodo Building. When JAL was originally established in 1951, its headquarters were in Ginza, Chuo, Tokyo. By 1965, Japan Air Lines was headquartered in the Tokyo Building in Marunouchi, Chiyoda, Tokyo. The Yomiuri Shimbun stated that because Japan Airlines worked closely with the Japanese government, people mockingly referred to the Tokyo Building as "a branch office of the transport ministry." On 28 June 1996, construction was completed on the JAL Building. On 27 July 1996, JAL moved its headquarters into the JAL Building. The Flight Operation Center at the JAL Building began on 20 September 1996. A holding company for JAL and Japan Airlines System, a carrier merging into JAL, was established on 2 October 2002; the head office of that company, Japan Airlines System (JALS) (日本航空システム, Nihon Kōkū Shisutemu), was in 2-15-1 Kōnan in Shinagawa Intercity, Minato, Tokyo. On 11 August 2003, the headquarters of JAS moved from Haneda Maintenance Center 1 to the JAL Building. On 25 November 2003, the JALS headquarters moved to the JAL Building. Originally the JAL Building was co-owned by Japan Airlines and Mitsubishi Trading Co.; they co-owned a subsidiary that owned the JAL Building. In 2004, the building was to be sold to Nomura Real Estate for 65 billion yen. The contract date was 1 December 2004, and the handover date was 18 March 2005. The JAL Subsidiary JALUX Inc. at one time had its headquarters in the JAL Building. One group of employees moved out of the building on 26 July 2010, and one moved out on 2 August 2010. The JAL livery is called the tsurumaru (鶴丸) or "crane circle." It is an image of a Japanese red-crown crane with its wings extended in full flight. The Tsurumaru JAL logo was created in 1958 by Jerry Huff, the creative director at Botsford, Constantine and Gardner of San Francisco, which had been the advertising agency for Japan Airlines from its earliest days. JAL had used several logos up until 1958. When the airline arranged to buy new Douglas DC-8s, it decided to create a new official logo for the inauguration of its jet service worldwide. In the creation of the logo, Huff was inspired by the personal crests of Samurai families. In a book he'd been given, We Japanese, he found pages of crests, including the crane. On his choice of the crane, he writes: "I had faith that it was the perfect symbol for Japan Air Lines. I found that the Crane myth was all positive—it mates for life (loyalty), and flies high for miles without tiring (strength.)" The tsurumaru livery was in use until 2002, when it was replaced by a livery called the "Arc of the Sun." The livery featured the motif of a rising sun on a creamy parchment-colored background. JAL is a strong supporter of UNICEF and expresses its support by having a "We Support UNICEF" logo on each aircraft. Following its corporate restructuring, Japan Airlines returned to the classic tsurumaru logo starting on 1 April 2011. A Boeing 767-300 was the last remaining aircraft that had the "Arc of the Sun" livery until it was retired in January 2016. JAL is known for adopting special liveries. A Boeing 747 (JA8908) carries an Adidas soccer livery in 2002. Another Boeing 747 (JA8907) is the Matsui Jet, featuring the famous Japanese baseball player Hideki Matsui in 2003. The airline's Boeing 767–300 (JA8253) is the Expo 2005 aircraft. Various aircraft in the JAL fleet carry a Yokoso Japan logo supporting the Visit Japan campaign. During late 2005, Japan Airlines began using a Boeing 777 (JA8941), featuring Japanese actor Shingo Katori on one side, and television series Saiyuki, along with its main character "Goku" on the other side. JAL is also known for its liveries featuring Tokyo Disneyland and Tokyo DisneySea, as it is the official airline of the Tokyo Disney Resort. It sponsors the attraction Star Jets (not related to past Star Jets fleet with the old tsurumaru livery), which feature a variation of the current livery on the ride vehicles. At one time there were more than six widebody aircraft painted with the special liveries. JAL, whose fleet was entirely made of Boeing 747 aircraft, had painted all of its aircraft with tropical-influenced liveries along with Reso'cha titles. These aircraft are used on charter flights to holiday destinations in the Pacific, such as Hawaii. Reso'cha is a marketing abbreviation for Resort Charter. Reso'cha aircraft were formerly known as JAL Super Resort Express. In April 2007, JAL debuted a Boeing 777–300 (JA8941) with a special Oneworld livery to promote the airlines's entry to the global airline alliance. Previously this aircraft carried the Shingo Katori and the Saiyuki television livery. In 2008, JAL repainted a single Boeing 777–200 to have a green rather than red arc on its tail, along with a green origami airplane on the fuselage, and named it the Eco Jet, to highlight the company's efforts to reduce the environmental impact of commercial aviation. In 2009, JAL repainted JA8941 again, as well as a JTA 737-400 (JA8933) to promote Kobukuro and their new album Calling as well as a live concert tour in Okinawa and around Japan. This livery was released officially on 30 July 2009. It has since then been replaced with a special Doraemon livery. On 4 September 2010, in conjunction with the Boku no Miteiru Fūkei album, JAL and Arashi (which one of the songs, "Movin' On", is used for a commercial) introduced a new livery featuring the five members of Arashi in the aircraft; the first flight was on the day after on 5 September. On 3 August 2017, JAL announced a new livery in commemoration of the new Despicable Me: Minion Mayhem ride in Universal Studios Japan. Landor Associates created JAL's brand identity in 1989. After Japan Airlines and Japan Air System merged, the Tokyo office of Landor and JAL worked together to create a new brand identity. Landor decided to use the "arc of the sun" image. The 2000s rebranding began in April 2002 and completed in April 2004. The brand identity firm designed 300,000 specific items for JAL. JAL changed its branding again on 1 April 2011, reverting to the original 1959 brand, with slight modifications. Japan Airlines serves 33 international destinations in Asia, the Americas, Europe and Oceania, excluding codeshare agreements. The airline's international hubs are Tokyo's Narita International Airport and Haneda Airport, Osaka's Kansai International Airport and Osaka International Airport in Itami. The airline group also serves 59 domestic destinations within Japan. In the fiscal year ended 31 March 2009, the airline introduced or increased services on ten international routes, including between Tokyo (Narita) and New York City, and between Osaka (Kansai) and Shanghai; and it ceased operations on four international routes, including between Tokyo (Narita) and Xi'an, and between Osaka (Kansai) and Qingdao. Domestically, JAL suspended 14 routes, including between Sapporo and Okinawa. Additionally, the airline expanded codesharing alliance with fellow Oneworld partners like American Airlines, British Airways, Cathay Pacific and Finnair, and other airlines, including Air France, China Eastern and Jetstar. In the early years, Tokyo Narita Airport had been the main hub of international and freight flights. Nowadays, Tokyo Haneda Airport is becoming an international hub because of its close proximity to the Tokyo metropolis, and the heavy expansion occurring there. As of February 2019, Japan Airlines operates an all-Boeing fleet of 167 aircraft. In October 2013, JAL ordered 31 Airbus A350s. Airbus A350-900 — 18 12 94 — 263 369 Order with 25 options. Delivery will begin in June 2019. As the Japanese government plans to add more slots at Tokyo's Haneda Airport by 2020 (in time for the 2020 Summer Olympics), Japan Airlines intends to order more widebodies for growth in 2018 or 2019: it could exercise its 25 options on Airbus A350s on top of its 31 firm orders, due for delivery from 2019, and study others such as the proposed Boeing New Midsize Airplane or the 787-10 to add to its 787-9 with 10 remaining to be delivered. Japan Airlines operates a mixture of narrow-body and wide-body aircraft. The airline provides economy class service on all routes; business class (J) service with larger seats in the cabin front on most major domestic routes; premium economy on some international routes; business class on most long-haul and some short-haul international routes; and first class on some long-haul and domestic routes. On 5 December 2017, JAL announced it had invested $10 million in the aircraft manufacturer Boom Supersonic, which is currently developing a new supersonic commercial airliner capable of seating up to 55 passengers. In exchange for its funding, JAL will be able to pre-order up to 20 Boom aircraft. JAL Cargo ended dedicated freighter aircraft operations in October 2010 after more than 30 years of service. It operated both propeller and jet aircraft through the years, most recently Boeing 747-400s (including aircraft converted from passenger to freighter configuration) and Boeing 767-300Fs. Limited cargo activity is now maintained through JAL's passenger aircraft lower deck holds. One crashed as Japan Airlines Flight 123. JAL introduced new international First and Executive Class seats: the JAL Suite for First Class, featured a seat 20 percent roomier than the Skysleeper Solo in a 1-2-1 configuration; and the JAL Shell Flat Neo Seat for Executive Class Seasons, a slightly revised version of the original Shell Flat Seat, with a wider seat; expanded center console; and the world's first in-flight photo art exhibit, Sky Gallery. These seats, along with the Premium Economy seats, debuted on Japan Airlines Flights 5 and 6, operated on the Tokyo–New York route on 1 August 2008. It expanded to the Tokyo–San Francisco route on 13 September 2008, and the Tokyo–Chicago and Los Angeles in 2009. Since 31 October 2010, the new cabin is also used on flights from Narita to Jakarta, being the only Asian destination for which the new cabin is used. In 2013, JAL debuted new versions of its economy and premium economy seats called Sky Premium and Sky Wider Economy respectively. The Sky Premium seats, found on selected 777-300's and soon 787's, feature the same width as the Sky Shell seats but with a 4" larger seat pitch of 42" and a 3" larger recline of up to 10" compared to a 38" pitch and 7" recline on the Sky Shell seats. The Sky Wider Economy seats, found on select 767's and select 777-300's, feature slimmer seats with 4" more legroom, and another inch of width totaling up to 35" of seat pitch, and a 19" width compared to the 31" pitch and 18" width of standard economy seats, plus a larger PTV screen of up to 11". The newer 787's will feature a new version of the Sky Wider seats called Sky Wider II, which will feature 5" more legroom and 2" more width totaling up to 36" of seat pitch and a 20" width in a less dense 2-4-2 setup instead of the 3-3-3 setup commonly used in a 787's economy cabin. In premium cabins, JAL introduced fully lie-flat seats, branded as Sky Suite in Business Class cabin and enhanced First Suite seats in First Class cabin. The Sky Suite is in a staggered 2-3-2 setup that offer direct aisle access to all business class passengers. These can be found on all 13 of JAL's Boeing 777-300ER aircraft (named SS7), 10 of JAL's 787-8 aircraft (named SS8) and 8 of JAL's 787-9 aircraft (named SS9). Later in 2015, JAL introduced a new version of Sky Suite, called Sky Suite II, in order to fit lie-flat seats on its new international 767-300ER fleet (named SS6), in a 1-2-1 setup. Since the seats are less wide than the original Sky Suite, SS6 aircraft are often seen on shorter international routes, like inter-Asian routes and Hawaiian routes. In 2016, as JAL was upgrading its Boeing 777-200ER fleet used on selected inter-Asian and Hawaiian flights, JAL introduced a third version of Sky Suite, called Sky Suite III, which is a lie-flat reverse-herringbone arranged seat. This seat is equipped on JAL's most Boeing 777-200ER fleet (named SS2) and 5 of JAL's Boeing 787-9 fleet (named SS9 II) in a 1-2-1 setup. Like SS6 aircraft, SS2 and SS9 II aircraft are operating on shorter international routes. All flights equipped with lie-flat J seats may be accessed here: for Sky Suite flights; for Sky Suite II flights; for Sky Suite III flights. The airline's international services with existing cabins feature the fully reclining JAL First Class JAL Suite; JAL Business Class JAL Sky Suite, JAL Sky Suite II, JAL Sky Suite III, JAL Shell Flat NEO, JAL Shell Flat Seat, JAL Skyluxe Seat or JAL Skyrecliner; JAL Premium Economy JAL Sky Premium or JAL Sky Shell Seat; and JAL Economy Class JAL Economy Class Seat or JAL Sky Wider. The First Class Skysleeper Solo reclines fully and features genuine leather upholstery from Poltrona Frau of Italy. The Executive Class Seasons Shell Flat Seat is a lie-flat design with the ability to lower armrests to the same height as the seat when reclined. Premium Economy is a recent addition, it was first introduced on the Tokyo–London route on 1 December 2007. It features a shell-shaped seat that allows passengers to recline by sliding their seat forward, without having the seat in front intrude when reclining. On Japan domestic services, the airline offers First Class, Executive Class Class J and Economy Class. The First Class seat is made from premium genuine leather with a seat width of about 53 cm (21 in) and a seat pitch of about 130 cm (51 in). Class J features ergonomically designed reclining seats that promote relaxation by allowing passengers to move naturally and maintain a balanced posture. JAL plans to begin refitting its domestic fleet with leather seats and in-flight wireless internet service from May 2014. MAGIC, JAL's in-flight entertainment system, supported by the JAL Entertainment Network (now renamed as JAL Mooove! ), features the latest hit movies and videos, games and audio programs. There are six generations of the MAGIC system: MAGIC-I, MAGIC-II, MAGIC-III, MAGIC-IV, MAGIC-V and the new MAGIC-VI. Introduced on 1 December 2007, the MAGIC-III system provides Audio/Video On Demand (AVOD) entertainment to all passengers. The number of movie, music, video and game channels on MAGIC-III was doubled from 57 to 130 by 2008; and it is installed on all seats on Boeing 767-300ER, 777-200ER and 777-300ER aircraft. Aircraft with MAGIC-I and MAGIC-II have movies that automatically start when the AVOD system is turned on—once the aircraft reaches cruise level—and economy class passengers can tune in to watch the movie in progress; and all movies restart upon completion. Executive and First Class passengers have full AVOD control. MAGIC systems also have JAL's duty-free shopping catalogue, including flight crew recommendations and a video of specials available on the flight. MAGIC-V will feature mostly the same entertainment as MAGIC-III, but with a touch screen controller, along with a handset. There will be USB ports for iPod connectivity, and an easier to control handset. (introduced on selected Boeing 767-300ER routes). The MAGIC-III system is used on internationally configured Boeing 767-300 with Skyluxe Seat, older internationally configured Boeing 767-300ER with Skyluxe Seat, all Boeing 777-200ER, older Boeing 777-300ER with Skysleeper Solo/Suite first class and Shell Flat Seat/Neo Business class. The MAGIC-IV is used on internationally configured Boeing 737-800s, along with a newer look of Skyluxe Seat. It uses 9-inch touchscreens by Panasonic SFX. The MAGIC-V system is deploying across the fleet, with selected Boeing 767-300ERs (Skyrecliner seat) and B787-8 (Shell Flat Neo seat) getting the IFE. Followed by refurbished Boeing 777-300ERs (all aircraft) and selected Boeing 767-300ER aircraft (including those with Skyluxe seat) will get the MAGIC-V along with new seats in all classes. The MAGIC-VI is installed on selected Boeing 787-8s and 777-300s. Skyward, the airline group's inflight magazine, reflecting the company motto of "Dream Skyward". Prior to the merger with JAS, JAL's inflight magazine was called Winds. All of the JAL Group magazines are provided by JALUX. In a promotion, between 1 June and 31 August 2006, all Executive and First Class passengers would be offered use of Nintendo DS Lites specially manufactured for air travel, with the wireless capabilities removed in order to conform with airline safety standards. After a trial run at Handa airport, JAL announced it will offer selected passengers a VR experience using the Samsung Gear VR and the Samsung S8. Passengers will be able to experience specially curated programming on Germany, Argentina, the Nagoya fireworks and more programs at a later date. 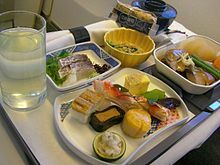 Japan Airlines offers meals on intercontinental routes, depending on the cabin class, destination and flight length. Western and Japanese menu selections are typically offered, including seasonal menu selections varied by destination. The airline has worked with high-profile chefs, including Fumiko Kono, Shinichi Sato, Koji Shimomura, Naoki Uchiyama, Chikara Yamada, Seiji Yamammoto and Hiroki Yoshitake in the creation of its menus and in 2016, launched a children's menu created by Kono, Yamada, Yamammoto, and Yosuke Suga. Sakura Lounge, named after the Japanese word for cherry blossom, is Japan Airlines' signature lounge. In addition, the airline also operates the following international, including First Class Lounge, Sakura Lounge annex and JAL Lounge; and domestic lounges, including Diamond Premier Lounge and JAL Lounge. Access to the lounges depend on the class of travel or the membership status in the JAL Mileage Bank or JAL Global Club. Circa the 1990s JAL previously operated buses from Frankfurt Airport to Düsseldorf to serve customers in that German city, as well as buses from John F. Kennedy Airport in New York City to Fort Lee, New Jersey. JAL Mileage Bank (JMB) is the travel rewards programme of JAL Group, including Japan Airlines, JALways, JAL Express, Japan Transocean Air, Japan Air Commuter, Hokkaido Air System and Ryukyu Air Commuter. The programme's airline partners also include JAL's Oneworld partners, as well as Air France, China Eastern Airlines and Emirates. For the airline's most frequent flyers, JMB offers Fly On Programme, a frequent flyer service status programme; and JAL Global Club (JGC), an exclusive club designed for experienced travelers. The Fly On Programme is the frequent flyer service status programme and is divided into four membership levels, Crystal, Sapphire, JGC Premier and Diamond, based on the member's travel in the last calendar year. The JAL Global Club is an exclusive club dedicated to catering to JAL Group's most experienced and valuable travelers. Japan Airlines has been the focus of several television programs in Japan over the years, most being dramas revolving around cabin attendants. Attention Please was a drama in 1970 that followed the story of a young girl who joins JAL to be a cabin attendant while overcoming many difficulties. This show was remade in 2006 again as Attention Please starring Aya Ueto who joins a class of cabin attendant nominees and later graduates. Most of the action of the story of the 2006 series takes place at JAL's Haneda flight operations headquarters. The series has had two specials since the original, marking the main character's transition into JAL's international operations. The company's internal processes prior to the crash of Japan Airlines Flight 123 and its reaction to the accident are subject of the book Shizumanu Taiyō and the 2009 Japanese movie of the same name, albeit the company being fictionalized as National Airlines. A 777-300ER of Japan Airlines was depicted in the anime film K-On! when the main characters were on their trip from Tokyo to London. The Cabin Attendant revolved around a JAL flight attendant who was accused of murder in New York. ^ "Japan Airlines Co Ltd company : Shareholders, managers and business summary". Retrieved 25 October 2016. ^ "Breaking News - Money". The Straits Times. Retrieved 1 October 2012. ^ Picken, Stuart D. B. (2016). Historical Dictionary of Japanese Business. Rowman & Littlefield Publishers. p. 203. ISBN 978-1-4422-5589-0. ^ a b c d "History of JAL 1951–1960". Japan Airlines. Retrieved 6 September 2009. ^ "Rising Sun and Air" (PDF). Flight. Reed Business Information. 4 April 1952. pp. 420–421. Retrieved 7 September 2009. ^ "News from Japan" (PDF). Flight. Reed Business Information. 13 March 1953. p. 341. Retrieved 7 September 2009. ^ a b "Japanese Plans Announced" (PDF). Flight. Reed Business Information. 31 July 1953. p. 151. Retrieved 7 September 2009. ^ "Brevities" (PDF). Flight. Reed Business Information. 19 February 1954. p. 221. Retrieved 6 September 2009. ^ "JAL celebrates 50 years of international flights". Agence France-Presse. 2 February 2004. Retrieved 6 September 2009. ^ "Schedule September 1, 2009 October 24, 2009 North America, Latin America, America, Canada, Mexico and Brazil" (PDF) (Press release). Japan Airlines. Archived from the original (PDF) on 7 October 2009. Retrieved 3 September 2009. ^ "JAL - Japan Air Lines". Retrieved 24 April 2015. ^ "国内初のジェット機展示へ　日航「富士号」、羽田の見学施設に". Nihon Keizai Shimbun. 28 March 2014. Retrieved 31 March 2014. ^ a b "History of JAL 1961–1970". Japan Airlines. Retrieved 6 September 2009. ^ a b c d e "Japan Airlines Company, Ltd". fundinguniverse.com. Retrieved 6 September 2009. ^ a b "World Airline Survey" (PDF). Flight International. Reed Business Information. 15 April 1965. pp. 586–587. Retrieved 7 September 2009. "Head Office: Tokyo Bldg, 2-chome, Marunouchi, Chiyoda-ku, Tokyo, Japan"
^ "Japan: Bitterness in the Air". Time. 3 September 1965. Retrieved 6 September 2009. ^ "History of JAL 1971–1980". Japan Airlines. Retrieved 6 September 2009. ^ a b c "History of JAL 1981–1990". Japan Airlines. Retrieved 6 September 2009. ^ Initial route was NRT-ANC-JFK-SJU-VCP-GIG; in 1981 it became NRT-ANC-MIA-VCP and in 1982 NRT-LAX-MIA-VCP. JL dropped Brazil for a few years around 1990. ^ "Bem Vindo: JAL to inaugurate New York-Sao Paulo flights". Business Wire. 20 September 1999. Archived from the original on 22 February 2012. Retrieved 25 January 2009. ^ "Japan Airlines America Region". Japan Airlines. Retrieved 7 September 2009. ^ "Major Deregulation Items Which the Ministry of Lands, Infrastructure and Transport Has Recently Decided". MLIT. Archived from the original on 30 April 2010. Retrieved 6 September 2009. ^ "History of JAL 1991–2000". Japan Airlines. Retrieved 6 September 2009. ^ Birtles, Philip (1998). Boeing 777, Jetliner for a New Century. Motorbooks International. pp. 13–16. ISBN 0-7603-0581-1. ^ Belson, Ken (13 November 2001). "Japan Airlines and Japan Air System Take Merger Move". The New York Times. Retrieved 6 September 2009. ^ a b "History of JAL 2004–". Japan Airlines. Retrieved 6 September 2009. ^ "Japan Airlines and Japan Air System Integration Progress Sales and Service Plans from April 1st 2004" (Press release). Japan Airlines. 7 January 2004. Retrieved 6 September 2009. ^ "JAL to merge domestic and international operations next year". Air Transport World. 6 October 2005. Retrieved 6 September 2009. ^ "JAL Decision to Seek oneworld Membership" (Press release). Japan Airlines. 25 October 2005. Retrieved 7 August 2009. ^ "oneworld becomes ten of the world's biggest and best airlines as Japan Airlines, Malév and Royal Jordanian board" (Press release). Oneworld. 1 April 2007. Archived from the original on 29 August 2007. Retrieved 7 August 2009. ^ "Planned Integration of Japan Asia Airways with JAL International" (Press release). Japan Airlines. 1 November 2007. Retrieved 6 September 2009. ^ a b c Negishi, Mayumi (14 September 2009). "Reuters: JAL to cut more staff, overseas flights: reports". Reuters. Retrieved 24 September 2009. ^ "Japan Airlines mulls cutting 5000 jobs in three years". The Age. Melbourne, Australia. 25 August 2009. Retrieved 3 January 2011. ^ a b c d Sanchanta, Mariko; Takahashi, Yoshio (20 January 2010). "JAL Bankruptcy Shakes Up Japan Inc". The Wall Street Journal. Retrieved 20 January 2010. ^ a b c "Japan Airline fate in hands of task force". Thomson Reuters. 1 October 2009. Retrieved 10 June 2011. ^ "JBankruptcy, ¥700 billion in public funds eyed for JAL". The Japan Times. 8 January 2010. Retrieved 10 January 2010. ^ "JAL headed for court protection: report". CBC News. 18 January 2010. Retrieved 31 December 2010. ^ Sanchanta, Mariko; Takahashi, Yoshio (20 January 2010). "JAL opens painful new chapter". Wall Street Journal. Archived from the original on 23 January 2010. Retrieved 20 January 2010. ^ "TSE List of Delisted Companies". Tokyo Stock Exchange. 20 January 2010. Archived from the original on 16 March 2010. Retrieved 20 January 2010. ^ "日航・稲盛氏、「大嫌い」からの出発". Nihon Keizai Shimbun. 19 February 2013. Retrieved 20 February 2013. ^ "Japan Airlines Promotes Masaru Onishi to President". Bloomberg. 27 January 2010. Archived from the original on 9 October 2007. Retrieved 1 February 2010. ^ anna.aero. "ANA and JAL both report massive load factor improvement on international services in 2010". anna.aero Airline News. Retrieved 4 August 2010. ^ "Report: JAL to slash more than 19,000 jobs by March 2015". ATW Online. 17 August 2010. Retrieved 17 August 2010. ^ "RTTNews – Japan Airlines In Talks With American Air As Delta Negotiations Continue – Reports". RTT News. 13 September 2009. Retrieved 24 September 2009. ^ Chakravorty, Jui (15 September 2009). "Air France-KLM in talks to invest in JAL-source". Reuters. ^ Woelfel, Joseph (18 September 2009). "Oneworld partners may team up on JAL offer". TheStreet.com. Retrieved 24 September 2009. ^ "BA in talks with JAL to stay in Oneworld". Reuters. 18 September 2009. Retrieved 24 September 2009. ^ "American Air CEO Sees 'Tepid" Growth, On 3Q Loss". DowJonesNewswires. 21 October 2009. Retrieved 21 October 2009. ^ "American Airlines chief urges JAL not to fly the Oneworld coop". Dallas News. 9 November 2009. Archived from the original on 30 July 2012. Retrieved 9 November 2009. ^ Sumikawa, Takuya (4 January 2010). "JAL boss opposes bankruptcy fix". Asahi Shimbun. Japan. Archived from the original on 4 January 2010. Retrieved 4 January 2010. ^ "JAL, Delta seen forming business ties". Asian News Network. 5 January 2010. Archived from the original on 29 October 2010. Retrieved 5 January 2010. ^ "Japan Airlines In Talks With American Air As Delta Negotiations Continue – Reports". Wall Street Journal. 13 September 2009. Retrieved 3 January 2011. ^ Reed, Ted (4 January 2010). "AMR: We're Not Losing Japan Air Lines Deal". TheStreet.com. Retrieved 4 January 2010. ^ Sanchata, Mariko (7 January 2010). "AMR Boosts JAL Offer". Wall Street Journal. Retrieved 7 January 2010. ^ "JAL dumps AA, defects to Delta, SkyTeam". eTurbo News. 28 January 2010. Retrieved 28 January 2010. ^ Sanchanta, Mariko; Takahashi, Yoshio (1 February 2010). "JAL to Decide on Partner Soon". The Wall Street Journal. Retrieved 1 February 2010. ^ Bavdek, Maureen (7 February 2010). "JAL to stay with American, end Delta talks". Reuters. Retrieved 7 February 2010. ^ "Japan Airlines and American Airlines Strengthen Partnership and Apply for Approval of Antitrust Immunity" (Press release). Japan Airlines. 9 February 2010. Retrieved 9 February 2010. ^ "Japan turnaround body picks underwriters for JAL stake sale". Reuters. 15 July 2011. ^ "Japan Airlines plans to relist shares in Tokyo". BBC. 6 January 2012. ^ "British Airways, JAL plan joint business". Reuters. 8 February 2012. ^ "Finnair to Tighten British Airways-Japan Airlines Tie-Up". Bloomberg. 1 July 2013. ^ "JALグループ情報". 日本航空. Retrieved 19 May 2016. ^ a b "Annual Report 2009" (PDF). Japan Airlines. 2009. p. 51. Retrieved 3 September 2009. ^ "Corporate Profile". JALUX Inc. Archived from the original on 21 March 2006. Retrieved 3 September 2009. ^ "Our business". JALUX Inc. Archived from the original on 28 August 2009. Retrieved 3 September 2009. ^ "Re: Notice of Convening of 2nd Annual General Meeting of Shareholders" (PDF). Japan Airlines. 8 June 2004. p. 10. Retrieved 3 September 2009. ^ "The termination of Large & Heavy service using WOW network" (Press release). Japan Airlines. 28 March 2005. Retrieved 3 September 2009. ^ "Annual Report 2009" (PDF). Japan Airlines. 2009. p. 2. Retrieved 3 September 2009. ^ "Announcement of Change in Trade Name." Japan Airlines. 28 March 2011. Retrieved on 28 April 2011. ^ "商号変更のお知らせ." Japan Airlines. 28 March 2011. Retrieved on 28 April 2011. ^ "Company Profile." Japan Airlines. Retrieved on 6 December 2011. "Head Office 4–11, Higashi-Shinagawa 2-chome, Shinagawa-ku, Tokyo 140-8605, Japan" – Japanese address: "東京都品川区東品川二丁目4番11号 野村不動産天王洲ビル"
^ "Top Archived 29 December 2011 at the Wayback Machine." Nomura Fudosan Tennozu Building. Retrieved on 6 December 2011. ^ "Recent Projects." Kajima Corporation. Retrieved on 6 December 2011. ^ a b "JAL SELL TOKYO H.Q. BUILDING TO NOMURA REAL ESTATE." Japan Airlines. 2004. Retrieved on 6 December 2011. ^ "Corporate Profile." JALPAK. Retrieved on 6 December 2011. "Head Office Nomurafudousan Tennouzu Bldg., 2-4-11 Higashishinagawa Shinagawa-ku, Tokyo, Japan 140-8658"
^ "Hotel profile Archived 2 January 2012 at the Wayback Machine." Hotel Nikko Alivila. Retrieved on 6 December 2011. "JAL Hotels Co., Ltd." and "2-4-11 Higashi Shinagawa, Shinagawa Ward, Tokyo, Japan 140-0002 (JAL Bldg. 13F)"
^ "Customer Service Archived 1 January 2012 at the Wayback Machine." American Airlines Japan. Retrieved on 6 December 2011. "American Airlines Japan Office Address: 2-4-11, Higashi-Shinagawa, Shinagawa-ku Tokyo 140-0002"
^ "1951–1960." Japan Airlines. Retrieved on 6 December 2011. ^ "Full-Member of The Investment Trusts Association, Japan." The Investment Trusts Association, Japan. Retrieved on 6 December 2011. "(Tokyo Building) 7–3, Marunouchi 2-chome, Chiyoda-ku, Tokyo "
^ "Descent into Japan Airlines Bankruptcy." Yomiuri Shimbun. Sunday 4 January 2010. Retrieved on 6 December 2011. ^ "JAL 1991–2000." Japan Airlines. Retrieved on 6 December 2011. ^ "History of JAL 2001–2004." Japan Airlines. Retrieved on 6 December 2011. ^ "History of JAL 2001–2004." (Japanese) Japan Airlines. Retrieved on 14 December 2011. "日本航空システム(本社：東京都港区港南2-15-1"
^ "Corporate Profile." JALUX. 21 March 2006. Retrieved on 6 December 2011. "Head Office JAL Building, 2-4-11 Higashi Shinagawa, Shinagawa-ku, Tokyo"
^ "Notice of Office Relocation." Jalux. Retrieved on 6 December 2011. ^ Huff, Jerry (2011). Notes on Creation of Tsurumaru Logo. unpublished: self. p. 3. ^ "The New JAL Group Launches a New Look for the 21st Century THE ARC OF THE SUN" (Press release). Japan Airlines. 18 September 2002. Retrieved 4 September 2009. ^ "Annual Report 1999" (PDF). Japan Airlines. 1999. p. 20. Retrieved 4 September 2009. ^ "JALグループの新しいロゴマークの採用について." Japan Airlines. 2011-01-19. Access date 2011-01-19. ^ "JALで行く東京ディズニーリゾー ト" (in Japanese). Japan Airlines. Retrieved 4 September 2009. ^ "Reso'cha (JAL Aircraft Collection)". Japan Airlines. Retrieved 23 September 2009. ^ "First JAL aircraft with special oneworld livery makes debut flight" (Press release). Oneworld. 16 April 2007. Archived from the original on 23 May 2007. Retrieved 4 September 2009. ^ "Pictures of JA8941". Airliners.net. Retrieved 4 September 2009. ^ "JAL Eco Jet to Raise Awareness of Global Environment" (Press release). Japan Airlines. 22 April 2008. Retrieved 4 September 2009. ^ "JAL × Kobukuro Collaboration". Japan Airlines. Archived from the original on 27 June 2009. Retrieved 2009-09-04. ^ "「ＪＡＬ×コブクロ・ジェット」のデザインを決定し運航開始！JALマイレージバンク ＪＡＬ×KOBUKUROカードも誕生！" (Press release) (in Japanese). Japan Airlines. 29 July 2009. Retrieved 4 September 2009. ^ 西村, 綾乃 (30 July 2009). コブクロ：２人が描かれたジェット機が登場 格納庫で記念ライブ (in Japanese). Mainichi Shimbun. Retrieved 2 August 2009. ^ "特別塗装機「JAL 嵐JET」が就航！" (Press release) (in Japanese). Japan Airlines. 4 September 2010. Retrieved 4 September 2010. ^ Adams, Sean; Morioka, Noreen; Stone, Terry (2004). Logo Design Workbook: A Hands-on Guide to Creating Logos. Rockport Publishers. p. 162. ISBN 978-1-59253-032-8. ^ "JAL Group Re-establishes Identity with Corporate Policy and Logo Change." Japan Airlines. 19 January 2011. Retrieved on 19 January 2011. ^ "Company Profile – Flight". Japan Airlines. Retrieved 7 September 2009. ^ "Annual Report 2009" (PDF). Japan Airlines. 2009. pp. 14, 16. Retrieved 7 September 2009. ^ "Profile on Japan Airlines". CAPA. Centre for Aviation. Archived from the original on 29 October 2016. Retrieved 29 October 2016. ^ "For a CodeShare Flight". Japan Airlines. ^ "Airline Routes". Air Transport World. 30 June 2014. Archived from the original on 30 June 2014. Japan Airlines and Qatar Airways, both members of oneworld, began codesharing on Qatar operated flights between Doha and Tokyo Haneda. This is in addition to JAL’s codeshare on Qatar flights between Tokyo Narita and Doha, as well as between Osaka KIX and Doha from last Dec. 3. ^ Hofmann, Kurt (13 April 2018). "JAL, Russia's S7 Airlines to expand codeshare agreement". Air Transport World. Archived from the original on 5 May 2018. ^ "JAL / Vietjet Air plans codeshare service from late-Oct 2018". Routesonline. 23 October 2018. ^ "Japan Airlines Fleet Details and History". www.planespotters.net. Retrieved 3 July 2018. ^ "World Airliner Census 2017". Flight International. 15 August 2017. ^ "Domestic aircraft and seat configurations". Japan Airlines. ^ "International aircraft and seat configurations". Japan Airlines. ^ "JAL selects Airbus A350s as it seeks to down-size aircraft capacity due to competition and costs". CAPA Centre for Aviation. 7 October 2013. ^ "Airbus and Japan Airlines sign their first ever order" (Press release). Japan Airlines. 7 October 2013. ^ "Japan Airlines to start A350-900 ops in late 3Q19". Ch-Aviation. 26 January 2019. ^ a b "Airbus Orders and Deliveries" (Press release). Airbus. 8 June 2018. ^ "Boeing, Japan Airlines Announce Order for Four 787-8 Dreamliners" (Press release). Boeing Mediaroom. 20 September 2017. Retrieved 20 September 2017. ^ "Airline Insight: Japan Airlines". www.blueswandaily.com. Retrieved 25 September 2018. ^ Adrian Schofield (6 November 2017). "Japan Airlines Considers Fleet-Plan Options". Aviation Week Network. ^ "History of Aircraft". Japan Airlines. Retrieved 9 December 2017. ^ "Japan Airlines Fleet Details and History". Planespotters.net. 1 December 2017. Retrieved 7 December 2017. 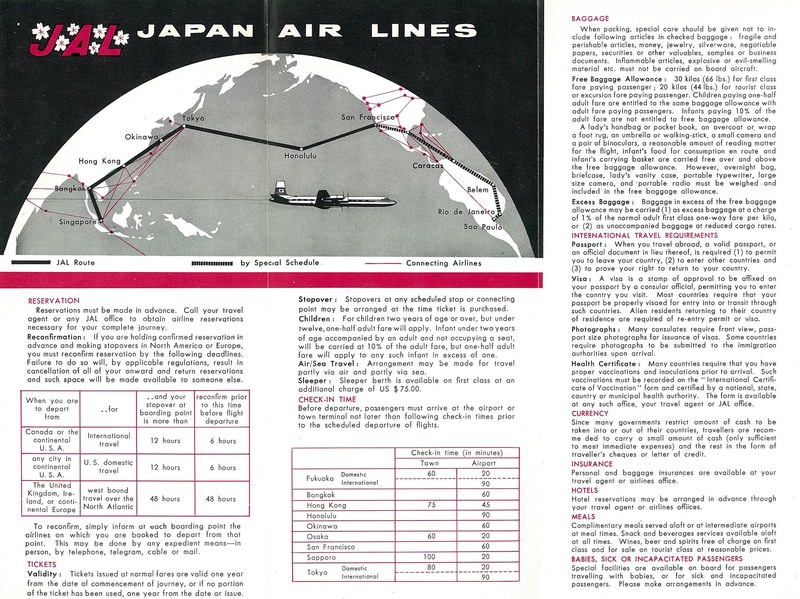 ^ "World Airline Directory – Japan Air Lines" (PDF). Flight International. Reed Business Information. 20 March 1975. p. 490. Retrieved 6 September 2009. ^ Phillips, Edward H. (1992). Beechcraft: Pursuit of Perfection; A History of Beechcraft Airplanes. Eagan, Minnesota: Flying Books. p. 27. ISBN 0-911139-11-7. ^ "JAL To Introduce State-of-the Art First Class Suite & Business Class Seat" (Press release). Japan Airlines. 10 June 2008. Retrieved 3 September 2009. ^ Logarta, Margie (20 August 2010). "JAL puts premium seat products on Tokyo-Jakarta route". Asia Pacific Business Traveller. Retrieved 4 June 2012. ^ "JAL Do It Again And Buck The Trend With Their 787". TheDesignAir. Retrieved 24 April 2015. ^ "Seats (JAL Business Class) - JAL International Flights". www.jal.co.jp. Retrieved 3 July 2018. ^ "JAL to Upgrade Business Class Seat on Its International Boeing 777-200ER" (Press release). 22 March 2016. Retrieved 26 September 2016. ^ "In-Flight Service – International". Japan Airlines. Retrieved 20 August 2009. ^ "JAL Skysleeper Solo". Japan Airlines. Archived from the original on 4 September 2009. Retrieved 20 August 2009. ^ "JAL Shell Flat Seat". Japan Airlines. Retrieved 20 August 2009. ^ "JAL Starts Introducing Premium Economy Class on International Routes" (Press release). Japan Airlines. 10 October 2007. Retrieved 20 August 2009. ^ "JAL Sky Shell Seat". Japan Airlines. Retrieved 20 August 2009. ^ "In-Flight Service – Domestic". Japan Airlines. Retrieved 2 September 2009. ^ "First Class – Outline of Seats". Japan Airlines. Retrieved 2 September 2009. ^ "Class J – Seat Description". Japan Airlines. Retrieved 3 September 2009. ^ "日航、国内線全席革張りシートに　14年５月から". 日本経済新聞. 28 October 2013. Retrieved 29 October 2013. ^ "JAL Group Renews In-flight Entertainment, Names it [New SkyEntertainment JAL Mooove!]" (Press release). Japan Airlines. 23 April 2013. Retrieved 5 October 2017. ^ "JAL Doubles MAGIC III Inflight Entertainment Programming" (Press release). Japan Airlines. 12 November 2007. Retrieved 3 September 2009. ^ "International In-Flight Services – Entertainment". Japan Airlines. Archived from the original on 4 December 2003. Retrieved 7 September 2009. ^ "Japan Airlines Upgrades Boeing 787-8 Interior". 12 November 2014. Retrieved 4 February 2017. ^ Jet, Johnny (7 December 2005). "Where's Johnny Jet?". JohnnyJet.com. Retrieved 3 September 2009. ^ "New In-flight Magazine for the JAL Group SKYWARD to debut in April 2003" (Press release). Japan Airlines. 18 November 2002. Retrieved 3 September 2009. ^ "Corporate Profile – Our Business". JALUX Inc. Archived from the original on 28 August 2009. Retrieved 3 September 2009. ^ "Japan Airlines to offer Nintendo DS Lite in-flight". Newlaunches.com. 9 June 2006. Retrieved 5 September 2009. ^ Heger, Monica (11 June 2008). "There is such a thing as a good airline meal". MSNBC.msn.com. Retrieved 4 July 2009. ^ "JAL Improves Meal Service in Business Class". Asiatraveltips.com. 26 August 2005. Retrieved 4 July 2009. ^ Webb, Sally (14 December 2014). "Airline food: Chefs striving to improve mile high meals". Stuff. Wellington, New Zealand: Fairfax Media New Zealand Limited. Retrieved 21 November 2016. ^ "JAL introduces new child meal menus developed by its star chefs". eTN Global Travel News. 21 April 2016. Archived from the original on 22 April 2016. Retrieved 21 November 2016. ^ Albright, John Brannon (10 October 1982). "Practical Traveler Not-so-exclusive Lounges". The New York Times. Retrieved 3 September 2009. ^ "International Flights Lounge Service". Japan Airlines. Retrieved 3 September 2009. ^ "Domestic Flights Lounge Service". Japan Airlines. Retrieved 3 September 2009. ^ "Make smooth connections at Frankfurt Airport when you use our "JAL EXPRESS" airport bus to or from Dusseldorf." Japan Airlines. January 4, 1997. Retrieved on July 26, 2018. ^ "For smooth access to and from J.F.K. Airport, ride our "JAL Express Bus" ." Japan Airlines. January 4, 1997. Retrieved on July 26, 2018. ^ "How JMB Works". Japan Airlines. Retrieved 10 February 2009. ^ "Flight Mileage". Japan Airlines. Retrieved 16 August 2009. ^ ""Stewardess monogatari" (1983)". IMDb.com. Retrieved 4 July 2009. ^ Van Buskirk, Eliot (30 October 2007). "Found In Translation: American Popstars in Japanese Ads". Wired. Condé Nast Digital. Retrieved 4 July 2009.